Wednesday, Sam and Alice had their Fall parties at school and now they are off for two days. District 11 scheduled conferences for the 30 and 31st, I think mainly to avoid school on Halloween. I have to admit that it is really nice not worrying about parties and costumes and making treats for school on Halloween. This way we can relax all day and then go out with lots of energy on the candy hunt. Paige had her Fall Party yesterday morning at preschool. All the little ones looked so cute! Alice was really sweet to Paige and held her hand around the classroom as all the kids trick or treated…. Sam decorating a mask during his Fall Party. Last night, we carved our pumpkins into scary Jack O’ Lanterns. Sam did a great job on his and only needed a little bit of help from Dad. Don’t worry, a 7 year old with a knife does sound alarming, but Scott was very close. 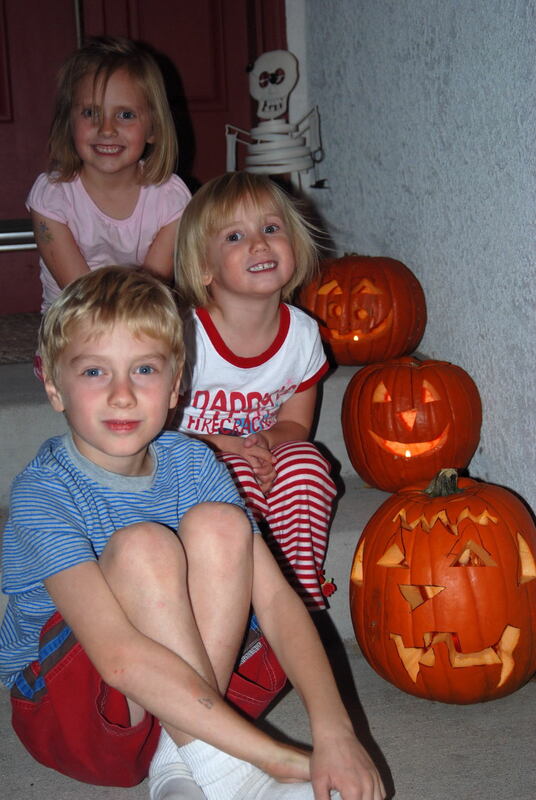 Alice and Paige designed their pumpkins with sharpies and then Scott and I did the cutting to reveal their creations! Afterwards, we played a mean game of Go, Diego! Go! rummy and snacked on the pumpkin seeds. Alice and Scott making silly faces. Oooo….scary!